Accelerators play an important role within startup ecosystems, as they provide priceless access to mentors, allow founders to receive expert product feedback, provide funding and offer various opportunities to pitch to investors. In return for the benefits an accelerator provides, it usually asks for percentage equity in the company (from 5 to 15%) or a chunk of the first seed round. Although this might seems a lot to give away, is important to remember that, according to Gallup, nearly 50% of startups fail in the first five years due to the lack of mentorship and lack of access to markets and potential partners. 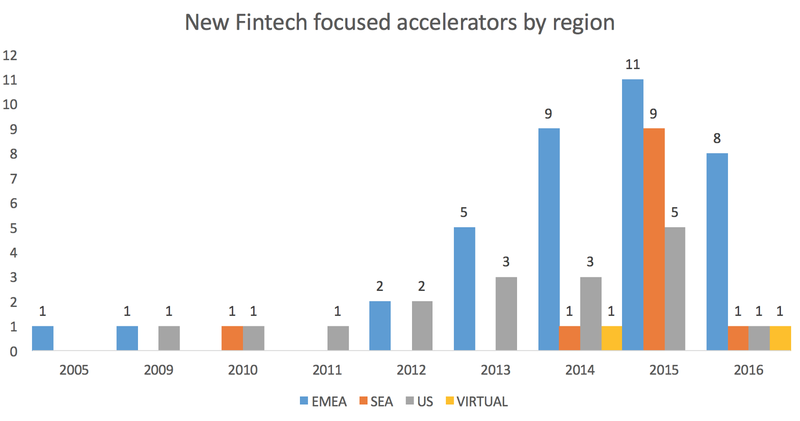 As the number of Southeast Asian fintech startups arise as well as the overall Fintech investment volumes in APAC, the number of established accelerators in the region follows, with 9 new accelerators established in 2015 alone. It’s no surprise most of fintech focused accelerators are nested either in Singapore or adjacent Hong Kong, as both cities are well positioned. First, their high concentration of financial companies gives them a particular advantage in wholesale and commercial banking innovation. Second, their geographic location at the heart of Asia allows them to drive financial inclusion through retail financial services. On the institutional side, Hong Kong and Singapore provide proximity to some of the largest potential fintech customer bases in the world. Seventy of the 100 largest global banks have a presence in Hong Kong. Some 200 banks with a total asset size of almost $2 trillion have operational headquarters in Singapore. Nevertheless, with fintech raising as major disruption in several countries of Southeast Asia, we expect more accelerators to be established to spark innovation in their national financial services. Malaysia CIMB bank is so far the first mover with the establishment of the InnoChallenge program in Kuala Lumpur. Following, a full list of the Fintech focused accelerators in Southeast Asia (incl. Hong Kong). Startupbootcamp is a global network of industry-focused startup accelerators with programs in Amsterdam, Berlin, Copenhagen, Eindhoven, Istanbul, London, Barcelona and Singapore. Startupbootcamp FinTech is the program focused on financial innovation, providing funding, mentorship, office space in the heart of London, New York & Singapore and access to a global network of investors and VCs, for up to 10 selected FinTech startups. Across the three locations, the accelerator supported 305 startups, with a funding rate of 72% and an average of €650,817 raised for each startup. Corporate partners include DBS Bank, RHB Bank, CIMB, Banca Intesa Sanpaolo, MasterCard, Infocomm Investments, Route 66 Ventures, Jungle Ventures, Pix Vine Capital, PwC. The program is also supported by the Monetary Authority of Singapore. United Overseas Bank (UOB) has partnered with Infocomm Investments Pte Ltd (IIPL) to set up The FinLab, to promote and to accelerate the growth of FinTech startups and innovators in the region. In addition to startups, The FinLab is also open to all UOB employees. This joint venture aims to help develop innovative startups that are focused on creating solutions in areas such as payments, wealth management, customer experience management, big data analytics and mobile banking. Over the next two years, The FinLab hopes to accelerate the innovation journey of at least 30 start-ups from the region through a series of three-month programmes. Citi was one of the first banks to launch a FinTech accelerator in Tel Aviv in 2013. They have since launched three classes, totaling 33 startups that graduated from the three-month program. In December 2014, Citi Ventures partnered with Plug and Play to to expand Citi’s accelerator efforts in the U.S., Germany, Singapore, Brazil and Spain. The program offers startups mentorship, feedback on product ideas and roadmaps, and introductions across the global networks of Citi Ventures, Plug and Play and other sponsoring partners. Led by The Co-Foundry (TCF), a leading accelerator in Singapore and Plug and Play (PnP), a global accelerator based in Silicon Valley, the TCF-PnP Program: Fintech Call seeks to bring together the best of the startup ecosystem and fintech industry. Partnering with the top global FX broker service provider, OANDA Asia Pacific and local VC and PE firm in Singapore, BlueHill Asset Management, the TCF-PnP Program: Fintech Call 2015 combines the best of the startup ecosystem with industry to propel fintech startups in reaching their full potential. Russian investment firm LifeSREDA.VC, which shifted its headquarters from Moscow to Singapore, launched the Singapore-based fintech accelerator programme called InspirAsia in 2015. LifeSREDA focuses on theme investments in the financial mobile and Internet projects, covering the U.S., Western and Eastern Europe, and since the end of 2014 also Asia. Life.SREDA Inspirasia accelerator has a unique focus, open only to seed-stage and Series A-stage startups, in addition to offering long-term partnership arrangements with projects. InspirAsia privileges startups in the following fields: mobile payments, mPOS and online acquiring, online lending and scoring, P2P lending, mobile banks, e-wallets, P2P transfers, remittances, pre-order services for restaurants and cafes, and mobile cash registers for retailers. Fatfish’s subsidiary Fatfish Medialab in Singapore operates the accelerator specializing in mobile, e-commerce and fintech areas. 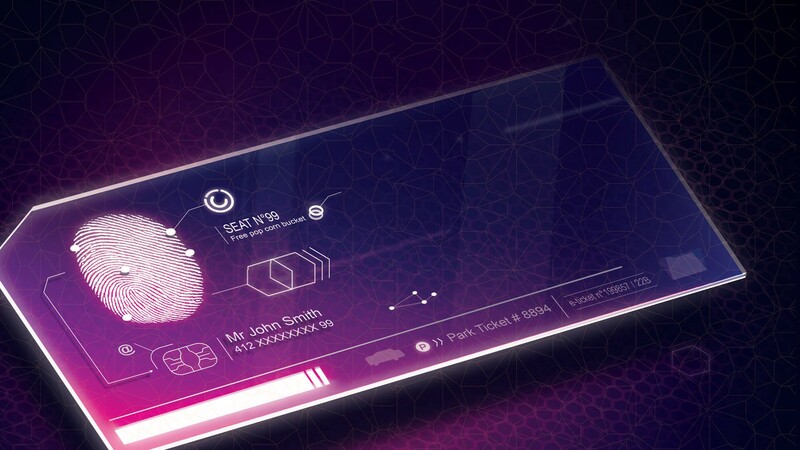 Fatfish Medialab is a first-of-a-kind digital incubator and investor in Asia that is laser-focused on a particular segment of the interactive digital media (IDM) space: mobile and social media apps. Fatfish Medialab has been appointed as an official partner of the i.jam funding scheme of the Media Development Authority of Singapore (MDA). The I.jam funding programme allows a co-investment partnership between Fatfish and MDA that sees investment of up to SGD250,000 of seed funding into early stage startup in exchange for minority equity position. The DBS HotSpot Pre-Accelerator is a programme organized by DBS bank and designed to cultivate entrepreneurship in Singapore through experimentation, mentorship and training. DBS HotSpot 2016 will have two distinct phases: DBS HotSpot Bootcamp and DBS HotSpot Pre-Accelerator. The first phase, DBS HotSpot Bootcamp, specifically focuses on helping 30 early stage startups with the conceptualisation of their ideas. Up to 10 startups will be invited to participate in DBS HotSpot Pre-Accelerator where each team will receive an entrepreneur award of SGD25,000. Entrepreneurs give up zero equity. DBS was the first bank in the region to organise a wholly-owned pre-accelerator programme when it launched DBS HotSpot in September 2015, as part of its SGD10 million commitment to develop the startup ecosystem. OCBC bank has partnered with Nest, a leading early-stage venture capital firm, to help run this programme in Singapore. Nest has a strong track record in this space and in 2015 they worked with international corporations to deliver accelerator programmes in the fields of FinTech, HealthTech and Smart Cities/IoT in both Asia and Africa. Open Vault is interested in five areas: wealth management, credit and financing, insurance, cyber security, and artificial intelligence — particularly in regard to data analysis and automated advisory service. CIMB Bank Berhad (CIMB Bank) partnered with Multimedia Development Corporation (MDeC) to work with application developers to support the innovation agenda through the launch of InnoChallenge, an incubation program aimed at ideation and conceptualisation of new fintech solutions. It was launched in May 2015 and drew encouraging participation nationwide. Both CIMB Bank and MDeC mentored participants with the aim of fostering entrepreneurship and creating new fintech ventures. DBS Accelerator is a collaborative initiative between DBS Bank (Hong Kong) and Nest, a leading startup incubator in the region and full-service ecosystem. It aims to create opportunities for innovators from across Asia and around the world to shape the future of banking and finance. Up to 10 startups are selected to travel to Hong Kong and accelerate their FinTech businesses in a dedicated 12-week programme. Fintech solutions in Big Data analytics, payments, risk management, security and P2P lending are among the innovations of the startups from Hong Kong and around the world selected to participate in the inauguralDBS Accelerator programme in Hong Kong, which officially kicked off in August 2015. Launched by Accenture in Hong Kong in June 2014, the FinTech Innovation Lab Asia-Pacific is part of a broader program spanning in New York, London and Hong Kong. The APAC edition runs thanks to a collaboration between Accenture and a dozen leading financial institutions — Bank of America Merrill Lynch, China Construction Bank (Asia), China Citic Bank International, Commonwealth Bank of Australia, Credit Suisse, Goldman Sachs, HSBC, J.P. Morgan, Maybank, Morgan Stanley, Standard Chartered and UBS. Its purpose is to nurture early-stage companies from around the world that are developing new technologies for the financial services sector with a particular focus on the Asia-Pacific region. The Lab is supported by Cyberport, which provides workspace for the entrepreneurs during the program. The SuperCharger has 3 strategic founding sponsors. Standard Chartered, a leading international banking group and one of the Hong Kong’s three note-issuing banks. Baidu, China’s leading internet search engine, will make available its API platform to connect FinTech providers and developers. TusPark Global Network (TGN), originated from Tsinghua University, brings with it over 20 years of expertise in operating technology parks and accelerator programs. The accelerator assists with company building, mentorship and advice in areas such as market entry, regulatory obligations and joint ventures opportunities. The program itself coincides during the peak time of financial and start-up activity. Within the first 3 weeks of the program, teams will be exposed to the Asian Financial Forum and the Invest HK Startme-Up week, providing a great opportunity for companies to get plugged into the global ecosystem and engage with world class decision makers. Another option to be considered by fintech startups in Southeast Asia is to join accelerator programs which run virtually. Such programs let founders keep working in their home countries while getting mentoring and networking support by the organizer and supporting companies. MasterCard Start Path is a global effort to support innovative early stage startups developing the next generation of commerce solutions today. Start Path was launched at the end of 2013 with an objective to help early stage startups succeed by leveraging a variety of options to work together. Startups can benefit from the knowledge of a global network of MasterCard experts, access to MasterCard customers and partners, and the ability to innovate on top of MasterCard solutions. Start Path aims to work with a diverse set of companies — from FinTech to Retail to Security to Big Data and beyond. There is no need for a startup to relocate and no equity is taken. An offshoot of the Bank Innovation blog, INV helps fintech startups from around the world. INV is the first non-geographically specific fintech accelerator, open to startups from anywhere in the world, with a particular focus on the world’s four major fintech hubs: Silicon Valley, Europe, Israel and New York. With support from Fiserv, a $20.5 billion banking information technology company, and a selection of top financial institutions that are members and mentors (Cross River Bank and U.S. Bancorp), INV cultivates fintech ideas and innovation. This article is an extract of the Fast Forward Advisors Fintech report, an ongoing effort of mapping the latest fintech trends in Southeast Asia as well as the leading fintech regions (US & EMEA). Stay tuned for more updates or shoot me an email at luca[at]fastforwardadvisors.com to receive a preview of the report — which will be available to selected partners.